2012 Blue-belly Barleywine aged in Maker’s Mark bourbon barrels. A snifter glass soon arrived full of a liquid that I had initially written off as being simply “black” in color, that is until I held it to the light and discovered the ruby highlights. 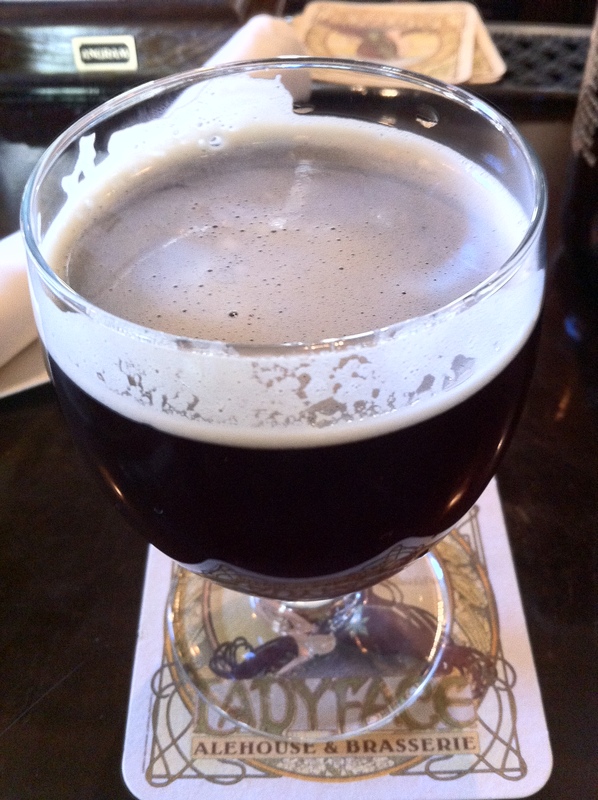 The head is a filmy manilla color with plenty of lacing splashing the sides of the glass. Trepidation started to creep into my mind after taking my first sniff. The nose was HUGE on bourbon and I was concerned that that was going to be the only thing I would notice in this beer. After a little searching I was able to detect a little brown sugar and red wine notes buried under the booze. Thankfully the actual beer set my mind at ease. It’s not nearly as overpowering as the nose prepared me for and was actually kind of sweet. It starts with a touch of bourbon, then red grapes and oak, a bit of brown sugar to mellow things out and then another peak at the bourbon. There is a faint red apple fruitiness that appears at the end. Mouthfeel is light and airy. It goes down smooth with just a twinge of heat from the bourbon. I was shocked how easy drinking this beer was. The nose is so full of bourbon that I was worried that it would wreck my palate (the habanero drizzle on my alligator flatbread ending up doing that). It is incredibly well-balanced and smooth with the bourbon forward in the taste, but not overpowering. Well done.